I don’t really remember how I first heard about the digital robot that would save money for me automatically, but the idea sounded so perfect I signed up immediately. At the time, about five years ago, it was a text message-based service that would watch how I spent money. When the time seemed right, a small sum of money would be spirited away and stashed in a savings account. This simple service eventually turned into an app, and over the years, more apps like it started to appear. I downloaded as many as I could. I got greedy about saving money effortlessly. So far, being proactive about better securing my financial future has been a positive thing. It’s been a slow process, one that’s always evolving based on the apps out there and what they offer. In the half-decade that I’ve been more serious about saving, I’ve seen these apps go from very basic ways to split up my paychecks to algorithmically driven investment tools, some of which I’m too scared to try. After all, I started doing this to save money, and the fact that I’ve actually made a few bucks over the course of a few years is a surprising bonus. I haven’t gotten rich. (I’m a blogger.) But I have started to pay much closer attention to how I spend money and, especially, how I save money. The many money-savings apps have also started to open me up to investing, which is something I used to think only rich people did. Not true! There are also investing apps now that make it easy to buy anything from a few bucks worth of stocks to a small sliver of a hedge fund. I feel like I’ve gone through three levels of a financial awakening thanks to all these apps. The first got me serious about saving. The second got me curious about investing. The third and ongoing stage has me feeling surprisingly optimistic about my retirement, which is decades away but closer than it used it be. I’m an aging millennial, after all, and we can’t just feel helpless forever. That text-based savings service I mentioned a second ago is called Digit. It’s grown up a bit, but when I first signed up the proposition was very simple: connect a bank and start saving money daily without even trying. The extent to which this actually added up to having extra cash for a vacation hinged upon me being able to spare the funds. Digit’s robots are designed to take out little bits of money that you won’t miss, and when I first started using the service, I couldn’t spare much. So I didn’t save much. Simply signing up for a savings bot changed me, though. Instead of feeling disappointed that I wasn’t saving more, I got more proactive. Digit lets you boost your daily savings amounts, so I did that. Digit also started charging a monthly fee of $3, which gave me pause. So I found other savings apps that offered me more ways to stash small sums. Some of them rubbed me the wrong way. A savings app called Long Game, for instance, tries to gamify your finances and even offers lottery-style drawings as an incentive to save more. It felt too much like gambling so I deleted that one pretty quickly. But I did latch on to others in an attempt to diversify the ways that I saved. A service called Qapital focuses heavily on setting goals and putting money away in separate silos. What I really liked about Qapital was the ability to save by rounding up debit card purchases to the next dollar. There are a bunch of other so-called “Rules” that will trigger a transfer from your bank to your Qapital account. It’s kind of like an if-this-then-that approach to savings. It works. More recently, banks have gotten on board with this effortless savings trend, too. I’m a longtime fan and customer of Simple, an online-only bank that got its start in Brooklyn almost a decade ago. Earlier this year, Simple started offering a feature called “Protected Goals” which essentially amounts to my bank stashing a small percentage of my available funds into a savings account. The money is still available to me, but it doesn’t show up when I look at my available funds, so I’m not tempted to spend it. Once I have $2,000 in the Protected Goals account, I started earning 2.02-percent annual percentage yield. This promise of earning a tiny bit of interest is what drew me to some simple investment apps, too. It seems silly to admit, but I actually started investing my savings by accident. As I was scouring the App Store for savings apps, I saw that some of them offered returns on even tiny amounts of money. If I was going to let some app hold on to my money, I thought, I might as well earn a bit of interest on it. My gateway into investing was a very pretty app called Acorns. The name is does a nice job describing how it works: You can save small sums of money and earn small returns. Acorns also offers roundups and recurring deposits, which is how I’ve always added to my account. The app also employs a team of unnamed experts that invest in a very vague portfolio of stocks, and you can choose to invest on a spectrum from conservative to aggressive. I picked conservative at the outset, and although there’s been a little bit of yo-yoing in the year or two I’ve used Acorns, my all-time return is about one percent. Acorns also charges me $1 a month. (You can sign up for more Acorns services, like a retirement account, for $2 or $3 a month.) So I’ve been successful at saving money, but I’m not really raking it in. I can, however, withdraw money from my Acorns account any time I want. The app that’s paid off the most for me fully bills itself as an investment solution. It’s called Stash. Although it looked a lot like Acorns at first, I quickly realized that Stash gives you a lot more control over where and how you invest your money. You can pick from stock packages with cheesy names like “Roll With Buffett” and move money between them. There are also Mad Libs-style worksheets that will recommend investments to you. Stash very much feels like it’s designed to help idiots invest their money wisely, and as one of those idiots, I can confidently say that it’s successful in that mission. In my first year, my clumsy Stash investments delivered a 10 percent return. The only problem is that getting that money out of Stash is a little more complicated, as I have to sell off the stocks. For now, I’m holding. It’s safe to say that I thought of apps like Stash more as smart saving than I did proactive investing. Quite frankly, that’s how it feels. But the next level of personal finance apps is most definitely all about investing. These apps require minimum deposits, promise bigger returns, and even let you trade in real time. They deal with larger sums of money and that intimidates me, so I’ve been approaching them with caution. Betterment is the serious investment app I’ve spent the most time with. I first heard about it through an ad on my favorite podcast, and the promise of securing my financial future seemed compelling enough. This was a different beast than the nothing-to-lose savings app that got me started down this road, though. Betterment has no minimum deposit and charges a monthly fee of 0.25-percent monthly of your balance. The app also required a four- to five-day wait for withdrawals, which doesn’t bother me in the grand scheme of things. That’s slightly longer than what Qapital and Acorns require, though. In other words, Betterment is less of a savings app than it is a slick stock broker. Once you hand your money over to Betterment, you don’t really have to make many decisions to get started with investing. Things only get more serious from there. While Betterment promises healthy returns on moderate sums of money—think $100 rather than $10—you can commit even more money to apps and services that suggest even bigger profits. There’s the automated investment platform Wealthfront that requires a minimum investment of $500 and an annual fee of 0.25-percent of your assets. There’s also the do-it-yourself, commission-free investment platform Robinhood. If you’re feeling really sure of yourself, you can opt for a new hedge fund-powered app called Titan. That will require a minimum investment of $1,000. I don’t know how good the returns could be, because I haven’t tried these services. Quite frankly, I’m a little bit nervous about giving a big chunk of money to opportunities I’ve only read about on the internet. You should be, too. 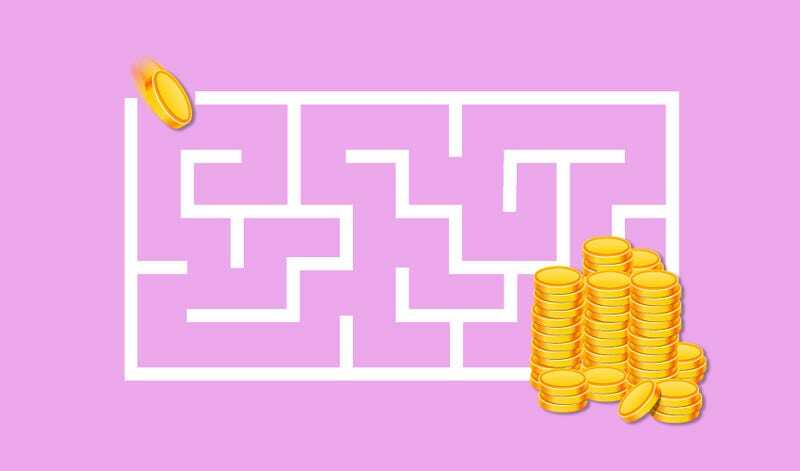 This maze of money-savings apps is something I’ve navigated slowly over the course of many years. There’s been fine print I’ve missed and certainly a small sum lost to fees I wasn’t expecting. (We’re talking dozens of dollars at worst but certainly not hundreds.) As the space gets more crowded, the spectrum of different options available and the granular details about how you save and invest money will only become more complex. So, as they say, read the fine print. As they also say, investing money involves risk. The gleaming bright side of all this is the hopeful idea that saving money and investing your savings is easier than ever thanks to technology. Yes, there are a lot of apps and services that want you to give them your money. No, not all of them are scams. Some, like Earnin and Even, are glorified payday loan programs. Others, like Qapital and Acorns, are well-established apps that I’ve successfully used to save money. And you can, too. Let me leave you with this tip: try them all and start small. It’s free to download most of these apps, and you’ll know in a few weeks whether or not they feel right to you. Looking back, I started out with a janky text-based service and no savings. Very slowly, I’ve been working my way up to responsible investing. I’ve done my Baby Boomer parents proud.